The Hovey Book: The English Ancestry and American Descendants of Daniel Hovey of Ipswich, Massachusetts, , at https://books.google.com/books?id=-VVVAAAAMAAJ . Haverhill, Mass. : Press of Lewis R. Hovey, (1914) , p. 202. Harrison Colby, A genealogy of the descendants of Abraham Colby and Elizabeth Blaisdell, his wife, who settled in Bow in 1768, , at https://archive.org/details/genealogyofdesce00colb . Concord, N.H.: Printed by the Republican Press Association, (1895) Microfilm #896944 of the Family History Library, Salt Lake City, Utah, p. 87. Church of Jesus Christ of Latter-day Saints. Salt Lake Temple, IGI reference to Sealings for the dead, couples and children (includes some living spouses and children) 1943-1970; heir indexes, 1943-1965, Salt Lake City: Filmed by the Genealogical Society of Utah, (1959, 1975, 1980) , Film Number: 1063709 and Film Number: 184722. 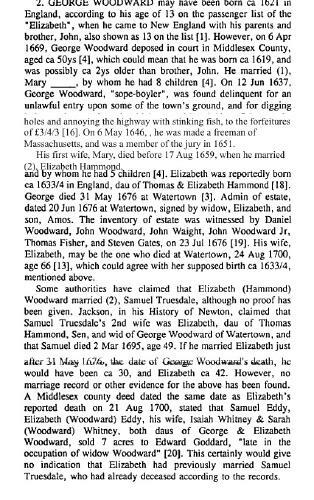 Your Woodbury/Ober Family Web Site, at http://www.woodburyober.com/d8.html citing NH State Vital Records, Concord, NH. Unfortunately, this website no longer exists. The Hovey Book: The English Ancestry and American Descendants of Daniel Hovey of Ipswich, Massachusetts, , at https://books.google.com/books?id=-VVVAAAAMAAJ . Haverhill, Mass. : Press of Lewis R. Hovey, (1914) , p. 199-202. Harrison Colby, A genealogy of the descendants of Abraham Colby and Elizabeth Blaisdell, his wife, who settled in Bow in 1768, , at https://archive.org/details/genealogyofdesce00colb . Concord, N.H.: Printed by the Republican Press Association, (1895) Microfilm #896944 of the Family History Library, Salt Lake City, Utah, p. 86-7. COLBY FAMILY & OTHERS at http://freepages.genealogy.rootsweb.com/~colby/colbyfam, /d254.html citing FHL Number 1001265; Birth and Marriage Index for New Hampshire. COLBY FAMILY & OTHERS at http://freepages.genealogy.rootsweb.com/~colby/colbyfam, /d301.html. New Hampshire. 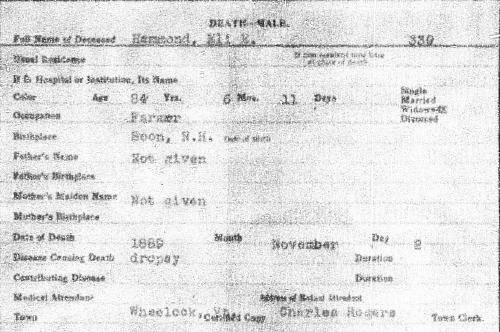 Registrar of Vital Statistics, Index to deaths, early to 1900, Salt Lake City: Filmed by the Genealogical Society of Utah, (1974) Microfilm #1001068 of the Family History Library, Salt Lake City, Utah, Index to deaths - Colburn to Conway , certified by Charles F. Hammond, town clerk of Bow, N.H.
"New Hampshire Marriage Records, 1637-1947," database with images, FamilySearch (https://familysearch.org/ark:/61903/1:1:FLXJ-7ZB : 12 December 2014), David Jr. Hammond and Esther Quimby, 03 Feb 1818; citing , Bureau of Vital Records and Health Statistics, Concord; FHL microfilm 1,001,265. Guy S. Rix, History and Genealogy of the Eastman Family in America, , at https://archive.org/stream/historyandgenea00rixgoog . Concord, N.H.: (1901) , p. 507. "Vermont Vital Records, 1760-1954," database with images, FamilySearch (https://familysearch.org/ark:/61903/1:1:XFWH-HM9 : 6 December 2014), Eli E. Hammond, 02 Nov 1889, Death; State Capitol Building, Montpelier; FHL microfilm 540,096. Harrison Colby, A genealogy of the descendants of Abraham Colby and Elizabeth Blaisdell, his wife, who settled in Bow in 1768, , at https://archive.org/details/genealogyofdesce00colb . Concord, N.H.: Printed by the Republican Press Association, (1895) Microfilm #896944 of the Family History Library, Salt Lake City, Utah, p. 92. 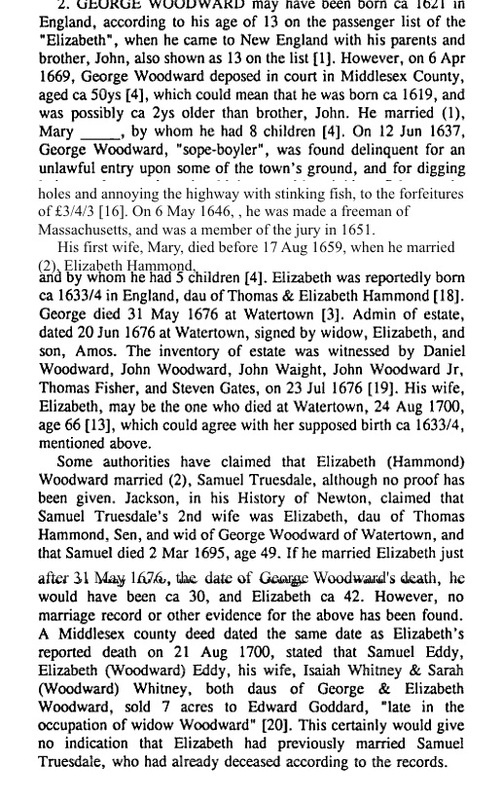 Evidently, she did not marry Samuel Truesdale as a second husband (see page image). William Richard Cutter, Genealogical and personal memoirs relating to the families of Boston and eastern Massachusetts, New York: Lewis historical Pub. Co., (1908) , Vol. 4, p. 2478. Temple Prime, Some Account of the Family of Prime of Rowley, Mass: With Notes on the Families of Platts, Jewetts, and Hammond, , at https://books.google.com/books?id=u9pIAAAAMAAJ . New York: (1887) , p. 37. 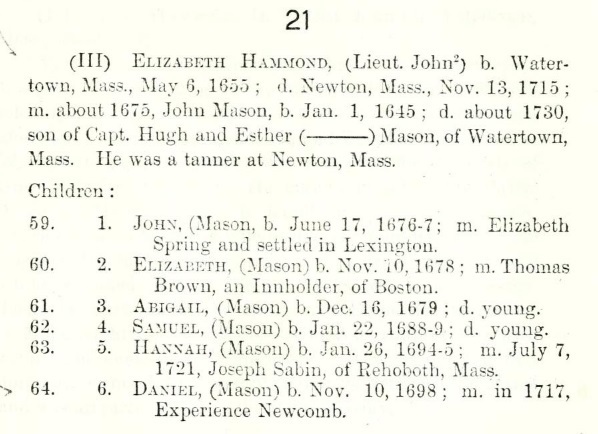 Henry Bond, Family Memorials: Genealogies of the Families and Descendants of the Early Settlers of Watertown, Massachusetts, Including Waltham and Weston; to which is Appended the Early History of the Town, , at https://books.google.com/books?id=3Yc-AAAAYAAJ . Boston: Little, Brown & Co., (1855) , Vol. 1, p. 272. Ellery Bicknell Crane, a class="ext" href="http://books.google.com/books?id=ByzhgLUOIRIC" Historic Homes and Institutions and Genealogical and Personal Memoirs of Worcester County, Massachusetts, /aThe Lewis Publishing Company, (1907) , Vol. 3, p. 15. Henry Bond, Family Memorials: Genealogies of the Families and Descendants of the Early Settlers of Watertown, Massachusetts, Including Waltham and Weston; to which is Appended the Early History of the Town, , at https://books.google.com/books?id=3Yc-AAAAYAAJ . Boston: Little, Brown & Co., (1855) , Vol. 1, p. 270. 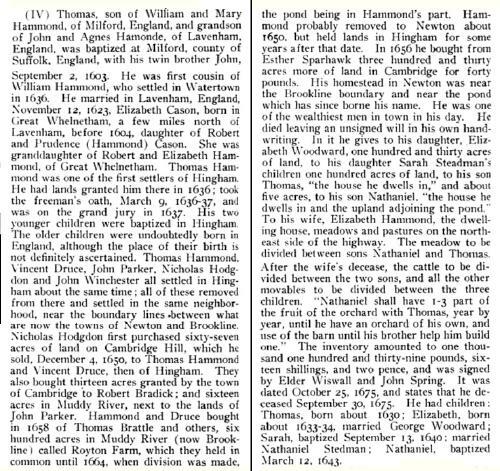 James Savage, A Genealogical Dictionary or The first Settlers of New England showing Three Generations or Those who came Before May, 1692 on the Basis of Farmer's Register, (1862) , vol. 2, p. 345. 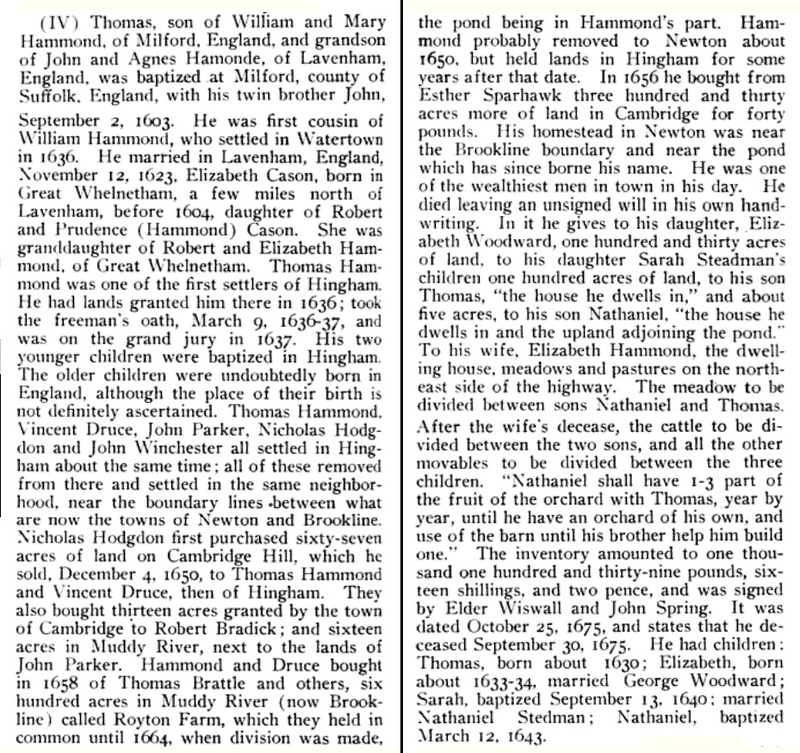 James Savage, A Genealogical Dictionary or The first Settlers of New England showing Three Generations or Those who came Before May, 1692 on the Basis of Farmer's Register, (1862) , vol. 3, p. 168. Church of Jesus Christ of Latter-day Saints. Salt Lake Temple, IGI reference to Sealings for the dead, couples and children (includes some living spouses and children) 1943-1970; heir indexes, 1943-1965, Salt Lake City: Filmed by the Genealogical Society of Utah, (1959, 1975, 1980) , Film Number: 1063709. Church of Jesus Christ of Latter-day Saints. Salt Lake Temple, IGI reference to Endowments for the dead, 1893-1970; heir indexes, 1924-1956; baptisms for the dead, 1941-1970, Salt Lake City: Filmed by the Genealogical Society of Utah, (1959-1979) , Film Number: 184279, Page Number: 570, Reference Number: 15226. Kathy Pinciaro, "Ancestors and their Descendants - Master Index," e-mail message from e-mail address to Steven G. Levine, 9/16/2008 2:04 PM. Ancestry.com. Massachusetts, Town and Vital Records, 1620-1988 [database on-line]. Provo, UT, USA: Ancestry.com Operations, Inc., 2011. Harrison Colby, A genealogy of the descendants of Abraham Colby and Elizabeth Blaisdell, his wife, who settled in Bow in 1768, , at https://archive.org/details/genealogyofdesce00colb . Concord, N.H.: Printed by the Republican Press Association, (1895) Microfilm #896944 of the Family History Library, Salt Lake City, Utah, p. 91. 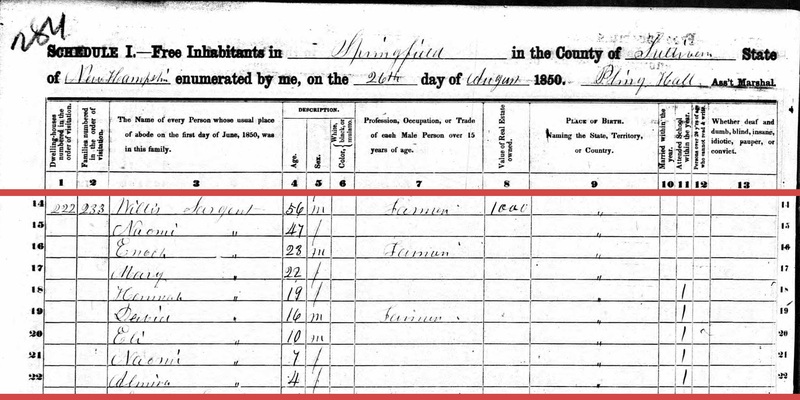 "Massachusetts State Vital Records, 1841-1920," database with images, FamilySearch (https://familysearch.org/ark:/61903/1:1:KB88-F62 : 4 December 2014), Sarah Eliza Cook, 12 Mar 1918; citing Death, Wakefield, Middlesex, Massachusetts, United States, certificate number 47, page 366, State Archives, Boston. Frederick Stam Hammond, History and genealogies of the Hammond families in America, Vol. 1, , at https://archive.org/stream/historygenealogi11hamm . Oneida, N. Y.: Ryan & Burkhart, (1902) , p. 152. 1880 United States. Census Office. 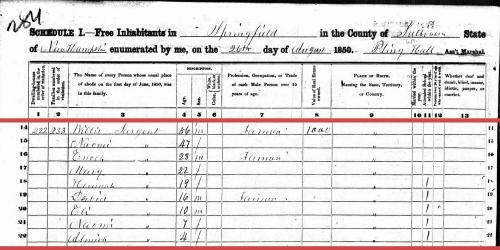 10th census, 1880 federal population census, Washington, District of Columbia: National Archives and Records Service, ([19--]) , FHL Film 1254765; National Archives Film T9-0765; Page 51D. Temple Prime, Some Account of the Family of Prime of Rowley, Mass: With Notes on the Families of Platts, Jewetts, and Hammond, , at https://books.google.com/books?id=u9pIAAAAMAAJ . New York: (1887) , p. 36. History of the Town of Hingham, Massachusetts, , at https://archive.org/stream/historyoftownofh0203hing . Cambridge: John Wilson and Son, (1893) , vol. 2, p. 286. Henry Bond, Family Memorials: Genealogies of the Families and Descendants of the Early Settlers of Watertown, Massachusetts, Including Waltham and Weston; to which is Appended the Early History of the Town, , at https://books.google.com/books?id=3Yc-AAAAYAAJ . Boston: Little, Brown & Co., (1855) , p. 779.